"Marine photosynthesis provides for at least half of the primary production worldwide..."
Photosynthesis in the Marine Environment constitutes a comprehensive explanation of photosynthetic processes as related to the special environment in which marine plants live. The first part of the book introduces the different photosynthesising organisms of the various marine habitats: the phytoplankton (both cyanobacteria and eukaryotes) in open waters, and macroalgae, marine angiosperms and photosymbiont-containing invertebrates in those benthic environments where there is enough light for photosynthesis to support growth, and describes how these organisms evolved. The special properties of seawater for sustaining primary production are then considered, and the two main differences between terrestrial and marine environments in supporting photosynthesis and plant growth are examined, namely irradiance and inorganic carbon. The second part of the book outlines the general mechanisms of photosynthesis, and then points towards the differences in light-capturing and carbon acquisition between terrestrial and marine plants. This is followed by discussing the need for a CO2 concentrating mechanism in most of the latter, and a description of how such mechanisms function in different marine plants. Part three deals with the various ways in which photosynthesis can be measured for marine plants, with an emphasis on novel in situ measurements, including discussions of the extent to which such measurements can serve as a proxy for plant growth and productivity. 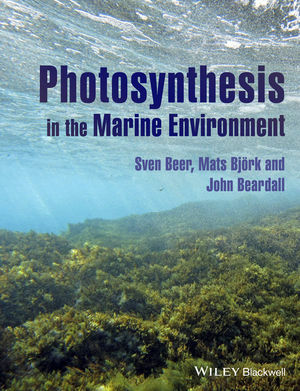 The final chapters of the book are devoted to ecological aspects of marine plant photosynthesis and growth, including predictions for the future. Sven Beer, Professor of Marine Botany, Tel Aviv University, Department of Plant Sciences, Faculty of Life Sciences, Tel Aviv University, Tel Aviv, Israel. Mats Björk, Botany Department, Stockholm University, Stockholm, Sweden. John Beardall, School of Biological Sciences, Monash University, Australia.